Improved buyer sentiments along with end-user demand and infrastructural push kept Bangalore’s real estate market relatively positive, as compared to other key markets in the country. Capital prices in the city surged up by three per cent this quarter, as against the previous quarter. Even as unsold inventory and poor conversion rates plagued real estate market across major metros in India, Bangalore remained relatively steady, if not promising, with an overall capital appreciation of three per cent. Experts attribute Bangalore’s resilience to real estate downturn majorly to its end-user driven housing market, rather than an investor-heavy one, as with other top metros such as Delhi NCR and Mumbai. The city witnessed a rise in the number of new launches in Jan-Mar 2015, as against the quarter ending December 2014. However, the second quarter of 2015 did not see much improvement in the number. This was apparent with only a marginal change in the number of under-construction and ready units in Apr-Jun 2015 as compared to the previous quarter. It may be inferred that developers in the city focused on selling the already available inventory rather than completing ongoing projects. The Bangalore Development Authority (BDA) announced its plan to collect a five per cent Metro cess on new layouts in the city. This conjectures added cost for the developers and ultimately the buyers. The move is estimated to make properties costlier by 10 per cent for the buyers, weakening the buyer sentiment. Industrial Corridor, has been seen a major stimulator to the realty ambience in Bangalore. To be developed with assistance from Japan International Cooperation Agency (JICA), the corridor is expected to be budgeted over Rs 38 million. Bangalore emerged as one of the most positive real estate markets in the country in the last one year. The quarter Apr-Jun 2015 witnessed an improvement in the number of transactions in the city, as compared to previous quarters. Though sale volumes did not shoot exorbitantly, the city performed better on conversion rates and buyer sentiments due to being largely end-user driven. 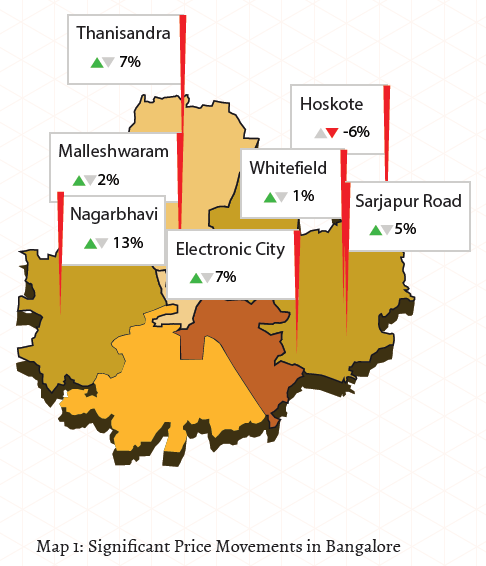 More than 75 per cent of the localities in East and South Bangalore recorded a growth in capital values in the quarter ending June 2015, indicating a burgeoning market. The eastern part of the city continued to be the most active, recording an average growth of four per cent in capital values, during the second quarter of 2015. South Bangalore, on the other hand, depicted a mixed trend with some localities posting appreciation, while others witnessed a dip in capital values. Varthur in East Bangalore was the top capital grosser in Apr-Jun 2015, clocking a rise of over 20 per cent in capital values. The locality has grown immensely on the back of its proximity to the thriving economic hubs of Whitefield and the Outer Ring Road (ORR). Recent launches, primarily in the villa segment, have bolstered the average capital values in the locality. The Y-o-Y rental analysis of the eastern and southern zones in Bangalore indicated a positive trend. Both zones registered a hike of seven to eight per cent, each, in rental values from April 2014 to April 2015, reflecting a buoyant market. More than 75 per cent of the tracked localities in the two zones recorded a rise in rental values in the last one year. The IT corridor in the East continued to be a major contributor towards a promising rental market in the city. Brookfield in the East was the highest gainer, clocking a rise of more than 20 per cent in rental values in the last one year. The list of top performers, was however, dominated by localities from the South. Localities such as Singasandra and Bannerghatta made to the top with rental values, recording a rise of more than 15 per cent, each. Price competitiveness led to increased demand in locations in and around Hosur Road such as Bommanhalli and Uttarahalli. However, as there has been a limited addition to the ready to use inventory in the area, rental values saw an upward trend in the last one year. Different phases of J P Nagar (phase 7 and 8) remained a preferred localities for renting among families. North Bangalore, one of the most promising real estate markets in the city, is gradually overtaking East and South Bangalore as the commercial centre since these zones are nearing saturation. This has propelled residential development towards the North and West. Commercial development, particularly in the aerospace and aviation sector, is following residential growth, particularly in the North. This has resulted in a price hike in certain micro-markets in these zones, amounting to an average growth of three to four per cent in capital values Q-o-Q. Areas in the North such as Hennur Road, Hormavu and Thansisandra witnessed an increase of 5-11 per cent in capital values during the second quarter of 2015. Almost 60 per cent of the localities in the list of top performers were from the North even though the top grosser, Nagarbhavi, was from the West. It clocked a growth of 13 per cent in capital values in the quarter ending June 2015. Availability of residential options in the price range of Rs 3800-4300 per sq ft has bolstered the demand from those working in Peenya industrial belt. The proposal to build skywalks along the ORR, which would ease the traffic from Nagarbhavi to the industrial hub, has also had a positive impact on the capital values. Rental markets across Central, North and West Bangalore remained largely positive in the last one year. With residential and commercial development shifting towards North Bangalore, the impact was reflected in the rental market too. Five of the top performing localities were from the North. These included locations such as Hennur, Road, Thanisandra, Jalahalli, Jakkur and Yelahanka New Town. These localities registered a rise of seven to nine per cent in rental values from Apr-Jun 2014 to Apr-Jun 2015. Central localities, however, notched the top spots on the list of top performers in the Y-o-Y analysis. Proximity to Namma Metro and ease of access to different parts of the city resulted in increased rental values in Frazer Town, Lavelle Road and Richmond Road. These recorded a rise of 13-18 per cent in the last one year. In the West, Raja Rajeshwari Nagar witnessed the highest rise in rental values in the last year. Proximity to the NICE Ring Road garnered well for the locality’s rental market. It recorded a yearly rise of close to 10 per cent. 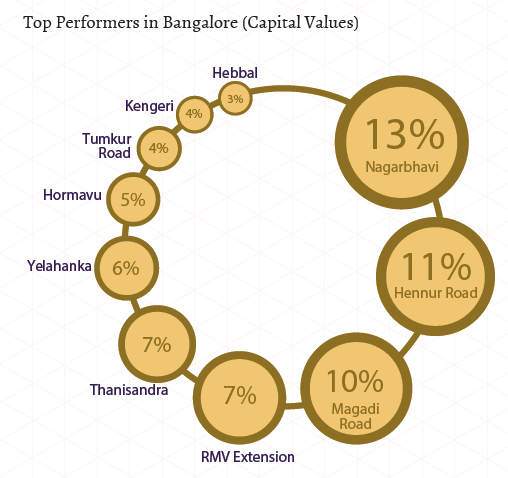 Yeshwanthpur, Sahakara Nagar and Hebbal in North Bangalore witnessed a dip in rental values. Hebbal being thickly populated is losing out on rental demand. Lack of adequate water supply and power hampered rental growth in Sahakara Nagar. Bangalore’s residential real estate witnessed stable sale volumes, despite lack of new launches. Sellers were focussed on offloading ready units rather than adding more to the piled-up inventory. Most of the ready-to-move-in units were priced within Rs 60 lakh to Rs 1 crore. Supply of various property types – residential apartments, builder floors and independent houses/villas witnessed insignificant variations in Apr-Jun 2015, as compared to Jan-Mar 2015. 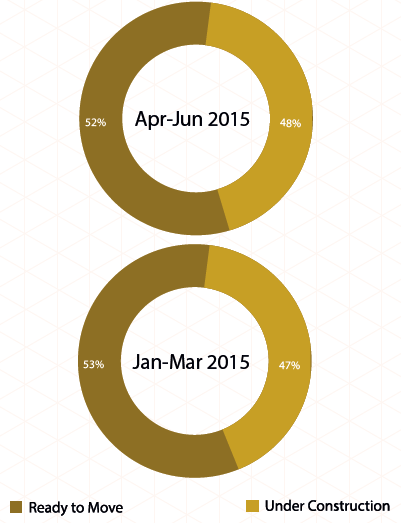 Residential apartments continued to capture more than two-third of the total market share. Being the IT hubs and therefore catering to majority of the housing demand of the city, both South and East Bangalore saw maximum supply of residential apartments. Both the zones, together, witnessed almost 75 per cent of the total supply of apartments in the city. Supply of independent houses/villas in the city remained almost unchanged in the last six months and stood at 16 per cent. Almost 40 per cent of the supply of these units was concentrated in East Bangalore, followed by South Bangalore (close to one-third). Builder floors continued to be the least supplied property type in the city, as per listings with 99acres.com. South Bangalore recorded the maximum supply of these units. With the growing focus on affordable housing in the country, Bangalore saw an increased supply of homes within a budget of Rs 40 lakh. In the quarter ending June 2015, supply of affordable homes witnessed a considerable hike (four per cent) and stood at 20 per cent. South Bangalore had the maximum share of its properties within the said budget. Mid-income housing category, having properties priced between Rs 40-60 lakh, continued to be the most supplied in the city and captured almost one-third of the total market share. All zones, except Central Bangalore, had close to 30 per cent of their properties priced within this budget bracket. The high-income housing category (Rs 60 lakh and Rs 1 crore) captured another 30 per cent of the total market share. 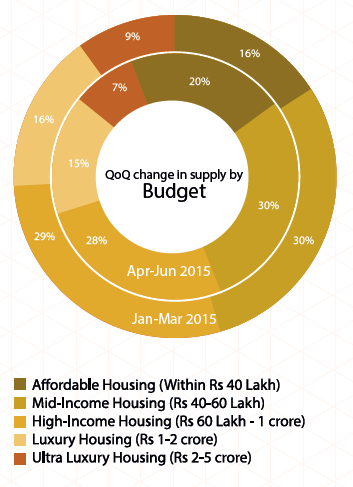 Amongst all zones, East Bangalore saw the highest supply of properties in this budget. Out of the total properties in North Bangalore, maximum were located in the high-budget category. Presence of airport and growth of IT companies drove several long-term investors to this region. The combined supply of luxury-housing (Rs 1-2 crore) and ultra-luxury housing (Rs 2-5 crore) dipped by three per cent and stood at 22 per cent in Apr-Jun 2015. While luxury housing captured 15 per cent of the total market share, ultra-luxury housing made up seven per cent of Bangalore’s residential real estate. Saturation in Central Bangalore resulted in high property prices. Almost 70 per cent of the properties in in this zone were priced within Rs 1-5 crore. High demand from IT professionals for both buying and renting mid-sized homes led to 2BHK units being the most popularly supplied in the city. With an insignificant rise in Apr-Jun 2015, as compared to the quarter ending March 2015, these units captured half of the total market share of the city. Undoubtedly, South and East Bangalore saw the maximum supply of 2BHK units. 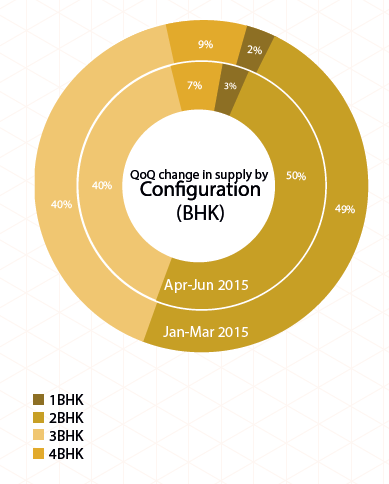 Amongst all zones, Central Bangalore had least number of properties configured as 2BHK units. Supply of 3BHK units remained stable at 40 per cent. While East Bangalore recorded the maximum inventory of these homes (37 per cent), South closely followed and captured 35 per cent of the total market of 3BHK units in the city. With dipping demand for high-priced homes, supply for 4BHK units also dipped by two per cent. The category recorded seven per cent supply, out of which, East Bangalore had maximum inventory of the same. Out of the total inventory in Central Bangalore about 20 per cent were configured as 4BHK units. Supply of these units in all other zones was below 10 per cent. 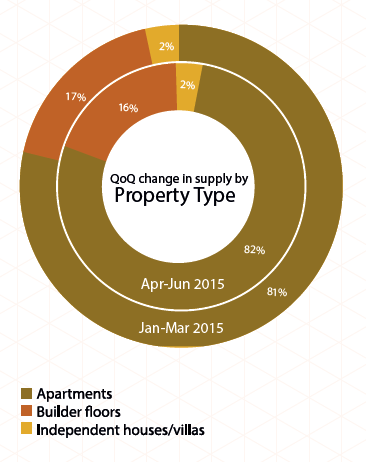 Similar to the previous quarter, Bangalore had more than half of its inventory under-construction. With developers focussing on selling ready-to-move-in units and thereby, refraining from launching new projects, the supply statistics witnessed an insignificant change in Apr-Jun 2015, as compared to Jan-Mar 2015. Out of the total under-construction units, maximum were recorded to be in East Bangalore (39 per cent), closely followed by South Bangalore (34 per cent). Majority of the under-construction properties were available in the budget bracket of Rs 40-60 lakh, followed by Rs 60 lakh – Rs 1 crore. More than half of these units were configured as 2BHK units. Almost two-third of the inventory in Central Bangalore, much higher than all other zones, was ready-to-move-in, specifically because of old constructions and lack of new developments.